[reposted from 10-21-2009] ISHRILA PRABHUPADA'S DISAPPEARANCE DAY REFLECTIONS: It is likely that most disciples of Prabhupada remember exactly what they were doing when they heard the news that indeed Prabhupada had “left his body,” 'disappeared," or departed this world for the spiritual plane or Goloka. As the death of our mother and father is a kind of initiation or rite of passage for everyone, when one’s guru leaves the planet, it calls for a new birth—and an unexpected, difficult one, as it ushers in a another stage of life. The guru is considered a kind of incarnation of God (a mercy incarnation)---he is an individual soul as we are, but is acting as a representative of Krishna. He or she is a tailor-made manifestation of Krishna just right for our particular nature. Although Krishna is present in scriptures such as Bhagavad-gita and Shrmad Bhagavatam, he is for the most part passive in this form—he doesn’t talk to us if we don’t understand or teach us how to follow the instructions. For that we require a guru, who is referred to as the “active agent of Divinity” because he not only asks us to read the scriptures, but will ask us if we have understood, and to explain it. Therefore we require both the book Bhagavatam and the "person Bhagavatam"—the person who lives the Bhagavatam and also teaches it by example. In pursuing spiritual life we have to become comfortable with the inconceivable aspect of the infinite God, and also with apparently contradictory qualities of him and his representative the guru. For instance, in the prayers to the Guru by Shrila Vishvanatha Chakravarti Thakur sung every morning at Mangal arotik, we learn that the guru should be seen as good as God. At the same time, he is a devotee of Krishna with a particular relationship with him. Our Guru is not to be considered like an ordinary person because, as above mentioned, he or she lives in the world to serve Krishna and his devotees—not for any material, selfish purpose. Though they may not know how many windows are in the Empire State building, they see Krishna everywhere, and know the illusion of "Maya", the Lord's covering potency which causes souls to forget God. Prabhupada said when asked this windows question, that there are as many windows in the Empire State Building as there are drops of water in an illusion of water—or something like this. By knowing Krishna one is considered to know everything. He or she is truly in the world, but not of it, though we have to see them in both an absolute and relative way. In an absolute or spiritual sense they represent God as a viceroy represents the crown (not God, but honored as his agent), and yet they appear as we do, with a body that has the needs for eating, sleeping, and maintaining. The philosophy of Lord Chaitanya comes into play here as it does in most things. We have to see the guru as inconceivably, simultaneously one and different from Krishna. That is difficult enough, but even more difficult is the view of Shrila Bhaktivinoda Thakur that a pure devotee may speak through a cultural filter, and have a certain bias on relative matters or social issues. Actually this perspective will save us from only having a one dimensional view of the guru. Although we may see the guru as our deity because from him we learn about the Supreme Deity of Krishna, we should not deify the guru by considering him or her infallible in all respects—in other words, as God. Our Guru speaks and we are encouraged to speak according to the time, place and circumstances—this means speaking spiritual truth in a way that is relatively understandable to people in the time and culture we live in. Thus, from our own experience, this is one way we can appreciate the relativity in the Guru’s instructions. In my experience, too much reverence for the guru prevents us from really taking advantage of their association, saying what should be said, or asking important questions. We are encouraged by Rupa Gosvami to have a sense of friendly reverence for the Guru. He is our best friend, yet we have to keep some distance so we don’t become too familiar. Therefore the guru is compared to fire—too close and we get burnt; too far away and we loose the effect of the fire, spiritual warmth or their example. The guru can be compared to our own heart appearing before us in the sense that in our guru we see our potential—what we can also become by following their teachings and example. When we hear them speak, it “hits home” or feels right. They articulate what we feel, though we haven’t been able to say it before. Having a guru then is not a foreign thing—someone getting in the way—but it's like meeting an old lost friend come to show us the way back to our real self. Of course, what they say may also challenge our cherished illusions and attachments. In the Hari Bhakti Vilasa by Sanatana Goswami we receive the instruction to accept a bonafide or qualified guru, which is an absolute instruction. He also says a shudra should have a shudra guru, a Brahman a Brahman guru etc. This is a relative instruction which could be translated as it may be helpful to have a guru from your own nation or culture so they can understand your psychology and give good recommendations accordingly. The most important thing is to have a qualified guru. In a choice between gurus, we want to feel called to accept him or her, and some relative analysis may also be useful. From another angle of vision we don’t want to discriminate against any Vaishnava on the basis of their background—anyone can become a devotee of Krishna, and anyone who knows the science of Krishna can become a guru. Therefore, we have to juggle many ideas and conceptions in order to really understand what Krishna consciousness is, and to not be fanatical or superficial in our understanding. 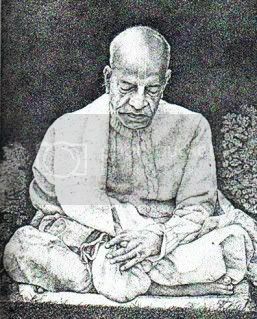 Great empowered souls like Prabhupada to a large extent present spiritual life in a very black and white way so as many people as possible can take up the path. Yet, when we go into the teachings deeply we discover there are many shades of gray, and that can be disconcerting. As a consequence, we are called to make adjustments in our understanding, gaining new realizations of teachings of Lord Chaitanya by the grace of our guru and the previous acharyas. This means we can't be complacent in our spiritual outlook. We are required to be thoughtful and pure in our intentions, nonenvious in our disposition, and remain convinced, yet open to be Krishna conscious. At least this should be our ideal that we want to obtain. In order to continue our unfinished spiritual practices from previous lives, and to exemplify ideal character, the guru appears in our life when our inner calling reaches a peak. The guru’s leaving the world is one of his or her tests to see if we have truly assimilated and understood the teachings. It is one thing to speak philosophy in the presence of the guru, and another thing to speak and act on the basis of those teachings in their absence—when they are no longer present to correct us. The guru’s physical presence is a strong call to action due to his or her spiritual power. Just to see them smile and receive their appreciation for our service is uplifting--as is even chastisement! In their physical absence we have to “see what we are made of” so to speak. We have to have more of an internal relationship, understanding that they are present in their instructions and disciples. And we have to be open to receive inspiration from instructing gurus or those devotees who give us wise counsel specific to our concerns. In fact, the example is given in the 11th Canto of the Bhagavatam, that spiritually advanced devotees receive instructions from natural phenomenon, animals, people—everything they come into contact with. Everything is Krishna’s energy, and so his pure devotee sees him behind everything and everyone in the world. All are his teachers—either how to act or how not to act. The world is friendly, because everything is favorable for serving the Lord of our hearts. We may be a long way from this universal vision, yet we can read about it, pray to obtain it, and to associate with those who live it. If we don’t have a guru but realize the importance, we can pray for the intense need to be under the shelter of Krishna’s representative. Krishna reciprocates with that. We hear the strong statement that we “must accept a guru” (tad-vijnanartham sa gurum evabhigacchet) like a heavy law weighing on us. However, there is another way to look at his statement. We want to come to a place where in our heart we feel, “I must accept this person as guru”, which is an inner calling. By our affection we are drawn to them, otherwise our life is lost. Here is our real self interest, a way to revive our eternal love for Krishna. We require a home knowing person to lead us to our spiritual home. We came to Prabhupada not because it was a law to accept a guru, but due to his affection for us, and what we felt in his company. No one cared more about us, or charmed our heart in such a way. We have to develop the faith that Krishna will provide us a suitable person to give us guidance in good faithful Vaishnava association. To do this we must study the scriptures, chant the holy name, engage in devotional service, associate with Vaishnava devotees, and understand our perilous situation in the world of birth and death. In addition we must comprehend the theory behind having a guru as part of this solution to our suffering, and as a necessity for making spiritual progress. Having a taste for spiritual life by the grace of our guru, we can never look at the material world in the same way. These are some of the thoughts I have had on this anniversary of Shrila Prabhupada’s disappearance. Submitted by Karnamrita on Fri, 2010-11-19 12:37.
the mercy of Lord Krishna, thru your thoughts expressed here, is proof of what you say. you have cleared many doubts and enlivened me again, by showing how "guru" is ALWAYS with us. i am ever grateful for your beautiful post, by the Lord's mercy. Jai Sri Sri Guru and Gauranga!